The Maxine's Challenge has just begun and it's time to consider this Vegan Starter Pack. 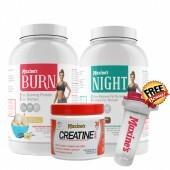 This pack includes a 2-tub of 908g Maxine's Pure Vegan with a bonus Maxine's Acetyl L-Carnitine + Matcha. Get this super saver pack now! 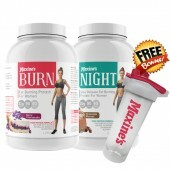 Maxine's Pure is a vegan and vegetarian-friendly natural women's protein powder that's ideal in helping you achieve your beautiful shape and tone. 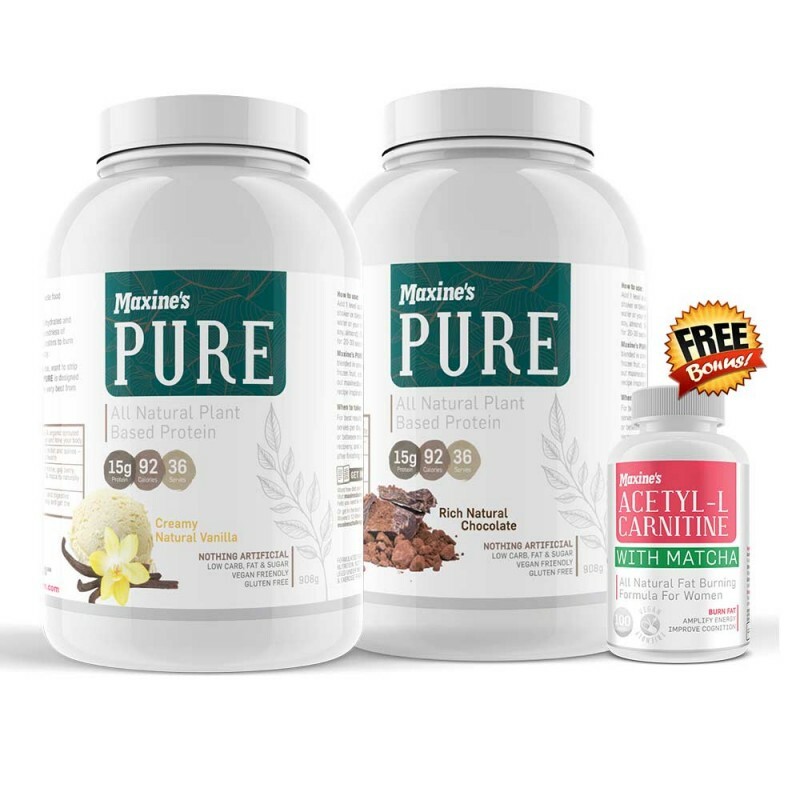 Maxine's Pure is packed with the perfect combination of all natural ingredients and two of nature's best plant proteins - Organic Pea Protein Isolate and Brown Rice Protein Isolate. 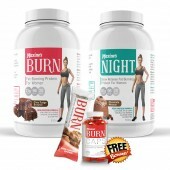 Pure is also considered to be an effective fat burning vegan protein as it's infused with ancient grains and natural fat burning plant extracts. 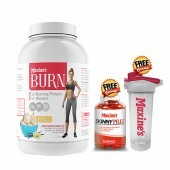 Each serving of Maxine's Pure boasts a whopping 15.1 g of Natural Protein that is lactose-free making it an awesome option for vegan and vegetarian trainers or women who are lactose-intolerant. 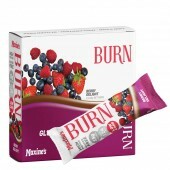 No worries in dealing with macros, Pure is low in fats and carbs. Give it a go with this delicious and all natural vegan protein! 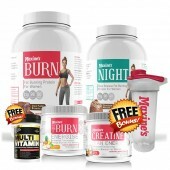 Shape and tone with Maxine's Pure Vegan Protein! Organic Pea Protein Isolate- is the most nature-friendly of all vegan protein. Peas are produced without the use of nitrogen fertilizer. It is a unique source of protein that is rich in essential amino acids and branched-chained amino acids. Pea Protein contains an ideal amount of the amino acids that are clinically and scientifically proven to increase muscle gains and prevent muscle breakdown after workouts. Pea Protein also aids weight loss which lower levels of the hunger hormone, ghrelin. Pea Protein supports a healthy heart as well by lowering high blood pressure. Organic Brown Rice Protein Isolate- is the highly nutritious protein component of brown wholegrain rice. It compliments Pea Protein Isolate to produce a balanced protein blend that is excellent for helping to tone and shape your body. It is also a low allergen food and a natural source of fibre, vitamins and minerals. Ancient Grains- a blend of ancient grains including amaranth, buckwheat, millet, chia and quinoa, these are grown from seeds that have remained unchanged since the birth of agriculture. They are high in nutrients, fibre and plant phenols while being free from manipulation and modification to retain the nutritional goodness nature intended. Green Coffee Bean Extract- bean contains polyphenols, including chlorogenic acids, which, like grape seed extract and green tea, have antioxidant that help the body neutralize harmful free radicals. Chlorogenic acids support the weight loss benefits of green coffee bean by promoting balanced blood sugar by inhibiting the release of glucose within the body and boosting the metabolic output of the liver, which burns fat. 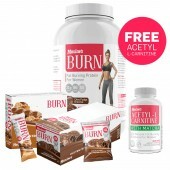 Carnitine- plays a key role in the processing of fat as fuel in cells throughout the body. 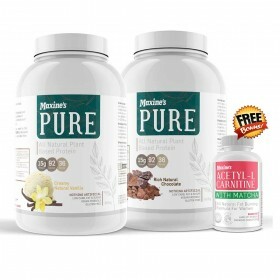 Carnitine helps fatty acids pass through the mitochondria, where oxidation of the molecules occurs. This is the principle way in which these fat molecules are used as fuel. 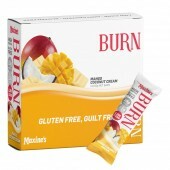 Maca- increases energy metabolism, mood and elevates and fat burning. Take 1 serve pre/post workout or physical activity.